Before you ask, yes, i do have DBT's green light to share this. This addon, once loaded AFTER D4D in an UPDATED G/ZDOOM DEV BUILD with Chex 3 will allow you to play the IWad with the D4D things, you can already load D4D with chex quest but where's the fun in that? -Flemoidus Commonus: Behaves likes the D4D zombieman. -Flemoidus Bipedicus: Behaves like the Shotgunguy. -Armored Bipedicus: Behaves like the imp. -Flemoidus Quadrumpus: Shoots 4 projectiles at once. -Flemoidus Stridicus: Has a projectile assault, may be removed or changed if it's too OP, it doesn't have the Demon's front armor. -Larva: A small and fast melee enemy. -Flemoidus Cycloptis: A flying enemy with the attacks of the shotgunguy, only shoots 3 projectiles at once. -Cycloptis Ultricus: Behaves like the Cacodemon. -Flem Mine: The same as the terrorist souls. -Flembrane: If you're close, it will do a shotgunguy-attack, at middle range it will shoot plasma like an arachnotron, if you're too far it spawns Flem Mines. -Maximus: Has the projectile attacks of the Baron and a close range flamethrower from the hell mancubus. -Flembomination: Currently behaves like the Spider Mastermind, which may be unfair seeing how you fight this thing in a long corridor. -Lord Snotfolus: Based on the cyberdemon, it can do the charged attack of the Baron, a cybermancubus acid assault ending with a baron ball or a barrage of flem fire, either high or low. 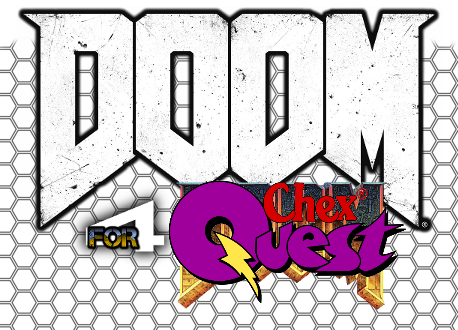 -Replaced Chex's stuffs with D4D's, now you wont see zorchers or their ammo, just D4D guns and their respective ammos, armor and health are also replaced, along with a few powerups. -Revised the end text for each episode, to fit them within the D4D mood. -A new cvar, user_GibAll, default enabled, when enabled, all flemoids explode on death, when disabled they only explode when they reach xdeath conditions, this cvar can only be changed by console for now. -Compatibility with the use classic monsters setting, though their decorate may be broken, they'll be fixed later. -The D4D Team, for obvious reasons, all the glory goes to them. -Me for sitting through this. I learned a lot about making decorate behavior with cvars and improved my knowledge of anonymous functions, i hope you have fun blowing stuff up in Bazoik!